This protocol describes a step-by-step method for the reproducible isolation and long-term culture of adult mouse cardiomyocytes with high yield, purity, and viability. Judd, J., Lovas, J., Huang, G. N. Isolation, Culture and Transduction of Adult Mouse Cardiomyocytes. J. Vis. Exp. (114), e54012, doi:10.3791/54012 (2016). Cultured cardiomyocytes can be used to study cardiomyocyte biology using techniques that are complementary to in vivo systems. For example, the purity and accessibility of in vitro culture enables fine control over biochemical analyses, live imaging, and electrophysiology. Long-term culture of cardiomyocytes offers access to additional experimental approaches that cannot be completed in short term cultures. For example, the in vitro investigation of dedifferentiation, cell cycle re-entry, and cell division has thus far largely been restricted to rat cardiomyocytes, which appear to be more robust in long-term culture. However, the availability of a rich toolset of transgenic mouse lines and well-developed disease models make mouse systems attractive for cardiac research. Although several reports exist of adult mouse cardiomyocyte isolation, few studies demonstrate their long-term culture. Presented here, is a step-by-step method for the isolation and long-term culture of adult mouse cardiomyocytes. First, retrograde Langendorff perfusion is used to efficiently digest the heart with proteases, followed by gravity sedimentation purification. After a period of dedifferentiation following isolation, the cells gradually attach to the culture and can be cultured for weeks. Adenovirus cell lysate is used to efficiently transduce the isolated cardiomyocytes. These methods provide a simple, yet powerful model system to study cardiac biology. Cultured cardiomyocytes are frequently used to monitor cell behavior in a well-controlled environment in vitro. For example, morphological, electrical, biochemical, or mechanical cell properties can be studied on engineered substrates,1,2 in defined media, and in response to small molecule drugs, peptides, gene regulation,3 or electrical stimulation.4 The cellular content can also be controlled using defined co-cultures.5 These in vitro experiments are useful in large drug or genetic screens and complement in vivo methods for various types of investigations involving cardiomyocyte biology. The isolation of viable adult mouse cardiomyocytes for short-term culture alone is known to be a challenging task. This protocol provides step-by-step instructions on how to achieve viable cardiomyocytes from adult mice that can be used for both short-term as well as long-term investigations. Cardiomyocytes isolated using this protocol can be efficiently transduced with adenoviral vectors20,21 and cultured for weeks. These methods provide a powerful system to study cardiomyocyte biology in vitro. The methods described herein are based on several elements from previous works using variations of the Langendorff retrograde perfusion.18,22 Although several protocols have been published on the isolation of adult mouse cardiomyocytes for short-term culture and study,23-25 the advantage of this protocol is the ability to culture the isolated cardiomyocytes long-term. This will be useful in the study of cellular processes involving ectopic gene expression and requiring extended periods of time, such as in cellular reprogramming strategies. All procedures outlined here have been approved by the Institutional Animal Use and Care Committee at the University of California, San Francisco. NOTE: Briefly, after extracting the heart from the mouse thorax, coronary retrograde perfusion is used to efficiently digest the extracellular matrix with collagenase and protease XIV. The ventricles are then isolated, mechanically dissociated and filtered into a single cell suspension. Gravity sedimentation is performed to isolate cardiomyocytes, which are separated from stromal cells like fibroblasts and endothelial cells by their high density. The purified cardiomyocytes can be cultured for weeks on laminin-coated polystyrene and transduced with adenovirus gene vectors. Prepare buffers and media according to Table 1. Turn on circulating water bath, set input temperature such that output of heated water jacket reaches a temperature of 37 ˚C. Clean perfusion system by flushing with 70% ethanol. Then remove all traces of ethanol from system by flushing with several volumes of sterile water. Load the perfusion system with perfusion buffer (Table 1). First drain water from system, then flush with 2 volumes of perfusion buffer. Then fill the dead space with perfusion buffer such that the inner column of the heat jacket is filled with perfusion buffer, but the debubbling chamber is empty. TIP: Ensure no air bubbles are present in the line below the debubbling chamber. To remove recalcitrant bubbles, engage all stopcocks and allow pressure to build up inside the line for a few seconds. Then release the lower stopcock, allowing the high pressure perfusion buffer to jet from the outlet; the rapid flow and turbulence will help dislodge bubbles that are caught near the perfusion outlet. Prepare a syringe with needle to be used for aortic cannulation. Attach an 18 G blunt needle to a 1 ml syringe filled with perfusion buffer. Remove air bubbles and fix the syringe assembly to one arm of the dissecting miscroscope illuminator with lab tape. TIP: To create a blunt ended needle from a beveled needle, transect the needle shaft with wire cutters. Then hone the tip with a sanding stone until the tip is flat. NOTE: To reduce slippage of the aorta from the needle during cannulation, roughen the shaft of the cannulation needle using a razor blade. Secure the needle by the hub and upper shaft, then saw the razor back and forth perpendicular to the long axis of the needle shaft while rotating until several grooves have been created within 1 cm of the tip of the needle shaft. Switch to a new razor when the blade becomes dull. Place a clean petri dish below the dissecting microscope to contain the heart during cannulation. Position the illuminator arm such that the tip of the cannula is near the edge of the viewing field, but not obstructing the dissection. Ensure the tip of the cannula is below the rim of the petri dish. NOTE: To help immobilize the heart during dissection, place a small (~ 5 - 7 cm2) square of 215 micron mesh in the petri dish. When the heart is placed on this mesh, it will create friction to reduce sliding and rotating of the heart during mechanical manipulation. Tie 2 sutures with loose double overhand knots around the hub of the cannula needle to be used for securement of the aorta. Administer heparin (5 IU/g body weight) via intraperitoneal injection. Wait 20 min to allow the heparin to circulate to the heart. Anesthetize the mouse by intraperitoneal injection of 20% ethyl carbamate (2 mg ethyl carbamate/g body weight). Observe closely until the mouse is under deep anesthesia (approximately 3 - 5 min). NOTE: Deep anesthesia is confirmed by a lack of both toe pinch and corneal reflexes. If the mouse has not reached deep anesthesia by 8 - 10 min, then administer an additional dose of ethyl carbamate. Although individual responses to anesthesia will vary between mice, failure to enter deep anesthesia upon first dosing may indicate degraded ethyl carbamate, which may preclude deep anesthesia even after repeated dosing. To prevent degradation, prepare a fresh solution of ethyl carbamate before each use. Immobilize the mouse to the surgery platform by securing each limb with surgical tape. Disinfect the incision area with a liberal amount of 70% ethanol. Pat dry with a lab-wipe. Lift the skin with tissue forceps just below the sternum. Make a lateral incision with small scissors, cutting through the skin and abdomen. Use hemostats to gently lift the ribcage via the sternum. Using small dissection scissors, extend the incision in a V-shape toward the axillae. Cut through the first rib and puncture the diaphragm on each side. Continue to lift the ribcage with hemostats and use small iris scissors to completely transect the diaphragm. Take care not to puncture the heart. Retract the ribcage rostrally using attached hemostats and quickly but carefully extend the V-shape incision by cutting through the ribcage toward the axillae on both sides. Retract the middle section of the ribcage fully and lay down the attached hemostats to hold in place. Remove the pericardium using fine forceps. While gently lifting the heart using curved forceps, transect the veins and arteries attached to the heart. Immediately place the heart in ice-cold perfusion buffer to slow muscle contraction. Place the heart in a petri dish under a dissection microscope (place on a small piece of 215 μm mesh to help immobilize during dissection). Trim any excess non-cardiac tissue using fine iris scissors. Use caution when cutting near the aorta. Transect the aorta near the brachioencephalic artery, and take care not to let bubbles or tissue debris enter the opening. Fill the petri dish containing the heart with ice cold perfusion buffer such that the liquid level rises above the opening of the cannula. Sheath the aorta onto the cannula such that the tip is just distal to the aortic valve. TIP: To reduce the risk of air embolism, slightly depress the syringe on the cannula prior to cannulation in order to remove potential air bubbles which may have developed at the end of the cannula. Additionally, keep the tip of the cannula and the aorta under the surface of the solution to avoid introducing bubbles while sheathing the aorta. Slide a pre-tied 7-0 silk suture down the shaft of the cannulation needle and position just above the tip of the needle. Tighten the knot with fine forceps. Repeat this step with a second suture placed just above the first. NOTE: Ensure the tip of the needle is still above the aortic valve before and after tightening. Slowly depress the syringe to eject 0.5 ml of perfusion buffer through the coronary vasculature. NOTE: If the cannulation was successful, blood will be visualized leaving the coronary vasculature and pooling out of the dorsal veins and arteries. IMPORTANT: The time from opening of the thoracic cavity (in particular, puncturing the diaphragm) to initial perfusion should be minimized to reduce hypoxic exposure and maximize the survival and health of the isolated cardiomyocytes. Ideally, this time should be less than 5 min. NOTE: The retrograde perfusion apparatus can be conveniently operated in a clean environment on a standard laboratory bench or placed in a laminar flow hood to maximize sterility. However, after perfusion is complete, work should be performed under laminar flow to minimize contamination. Gently but firmly remove the cannula hub from the syringe (using sterile gloves) by slowly twisting back and forth. While pulling the cannulation needle off of the syringe, slowly eject perfusion buffer into the needle hub in order to prevent air bubbles during perfusion. Remove the recirculating catch tube from below the perfusion outlet port and replace with a waste catch beaker. Attach the needle hub to the luer adaptor that is fixed to the perfusion outlet port (Figures 1, 2) on the water jacket, while the pump is running at the lowest setting (15 RPM, ~ 6 ml /min). TIP: When connecting the needle hub to the luer adaptor, allow the dripping perfusion buffer to connect to the liquid in the needle hub in order to avoid introducing bubbles. 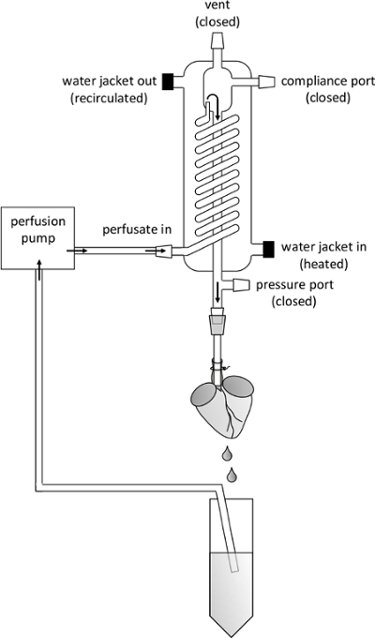 Perfuse the heart without recirculation until 8 ml of perfusion buffer have been aspirated by the inlet hose. NOTE: The volume of perfusion buffer aspirated by the inlet hose at this step assumes a dead volume of 7 ml for the perfusion system, giving a total of 15 ml of perfusion buffer pumped through the heart. Remove the inlet tube from the perfusion buffer. Allow air to be aspirated by the inlet for less than the dead volume of the system. NOTE: The volume of air aspirated in this step must be adjusted to prevent air from entering the coronary vasculature (see step 1.3.7). Place the inlet tube into the digestion buffer (Table 1), just above the bottom of the tube. Feed slowly and allow the inlet tube to aspirate enough volume to avoid overfilling the tube. Visualize and follow the air bubble between the perfusion buffer and the digestion buffer as it travels through the heat jacket. Observe the level of perfusion buffer in the center of the heat jacket begin to drop once the air bubble reaches the de-bubbling chamber. Once the digestion buffer reaches the de-bubbling chamber, the level of liquid in the heat jacket will remain steady. IMPORTANT: If the level of perfusion buffer drops too low, close the outlet stopcock and open the vent stopcock. Allow the level to rise to a comfortable level (3 - 5 inches above the outlet port). Then, stop the perfusion pump and close the vent stopcock. Open the outlet port stopcock and restart the perfusion pump. Watch the solution emerging from the heart. As the last of the perfusion buffer leaves the heart and the digestion buffer begins circulating through the heart, color change from clear to light brown will be observed due to the presence of collagenase. Perfuse the heart with digestion buffer for approximately 10 - 15 min. The heart will begin slouching as the collagen is degraded and it loses mechanical support. Remove the heart from the cannula with forceps and place in a dry petri dish. Quickly trim extra-ventricular tissue using fine iris scissors. Transfer the ventricles to a fresh petri dish containing perfusion buffer to wash. Move the petri dish to a sterile hood and transfer the ventricles to a fresh, dry petri dish. Collect 7.5 ml of digestion buffer from the heat jacket and add 2.8 μl of 1 M CaCl2, mix by inversion. Add 2 - 3 ml of digestion buffer with CaCl2 to the ventricles in the petri dish. Quickly triturate the ventricular tissue with fine forceps, so that most pieces are smaller than 1 mm3. Add the remaining Ca2+ supplemented digestion buffer from step 1.3.2 to the dissociated ventricles in the petri dish and mix by gentle agitation. Place the petri dish in a 37 °C incubator with 5% CO2. Agitate the petri dish every 2 min until sufficient cardiomyocytes (see NOTE below) have been released from the tissue. NOTE: The length of incubation may need to be adjusted to fine tune the degree of digestion according to the needs of the experiment. Generally, longer incubation times increase yield and purity, but may reduce the rate of cell attachment and survival. 5 - 10 min is generally sufficient to achieve a high yield (~ 5 - 10 x 105 cells per heart). Transfer the petri dish back to a laminar flow hood. Using a transfer pipette cut at a 45° angle, gently pipette the tissue to further dissociate. Use sterile gloves to fold the 215 μm mesh into a cone and hold over a 50 ml conical. Pipette the dissociated tissue suspension onto the mesh and allow the filtrate to drain into the 50 ml conical. Use 7.5 ml of pre-warmed stop buffer (Table 1) to wash the cardiomyocytes from the petri dish through the mesh, combining with the first filtrate. NOTE: Ca2+ is raised to final 1.1 mM and the final 2.5% FBS in the stop buffer neutralizes protease activity. Transfer the cell suspension to a 15 ml conical and allow to settle by gravity for 15 min. Carefully remove the supernatant with a transfer pipette such that only 50 - 100 μl of solution remains above the cells. Add 10 ml of pre-warmed, equilibrated culture media (Table 1) and mix by gentle inversion. Allow the cardiomyocytes to settle by gravity for 15 min. TIP: To increase purity, repeat step 1.4.8 as desired. Carefully remove the supernatant with a transfer pipette such that only 50 - 100 μl of solution remains above the cells. Pre-coat tissue culture-treated petri dishes with laminin (10 μg/ml) and store at 37° C for 2 hr prior to plating cells. Just prior to plating, aspirate the laminin solution from the tissue culture plate. Wash once with MEM or PBS, then aspirate residual liquid to remove non-adsorbed laminin. Add enough pre-warmed, equilibrated culture media to achieve desired cell density, mix by gentle inversion. Plate desired concentration of cells into the culture vessel (typically 5 - 20 x 104 cells/cm2). To assess the yield of cardiomyocyte isolation, count the cells via hemacytometer or test-plate by checking the density under a microscope. An adult mouse heart typically provides 0.5 - 1.0 x 106 cells at this stage of the protocol. TIP: If using 96 well plates, use a 1,000 μl micropipette with a tip cut at a 45° angle to minimize cell damage due to shear force. Place the pipette tip such that it is touching the bottom of the well during ejection of cell suspension in order to minimize introduction of bubbles. Move the cell culture dish promptly to a 37 °C incubator with 5% CO2 and 95% humidity. Change media as needed to prevent acidification: every 1 - 5 days depending on cell density. Minimize handling of the culture dish during the first 3 - 6 days to facilitate the attachment to the cell culture surface. NOTE: To minimize cell disturbance during media changes when the cells have not fully attached, perform a half-media change. Slowly aspirate the media while keeping the pipette tip just below the surface of the media. Then slowly add additional media by keeping the pipette tip just above the surface of the media against the wall of the culture dish. To assess the viability of cardiomyocytes, check the morphology under brightfield microscopy. Freshly isolated cardiomyocytes maintain a roughly rod-shaped morphology with sharp, distinct edges under brightfield illumination (Figure 2). NOTE: Confirm viability by staining the cells with trypan blue. To assess the purity of the cardiomyocyte isolation, check the cell morphology to identify cardiomyocytes. Stain the nuclei with Hoescht 33342 to identify total cells. Prepare adenovirus cell lysate using established methods.21 Transduce the cardiomyocytes using cell lysate from adenovirus producer cells 10. On day 0 or day 1 after isolation, carefully add the cell lysate to the media containing the cardiomyocytes. NOTE: A high titer adenovirus preparation will achieve strong expression in approximately 48 - 72 hr. Adjust the multiplicity of infection to suit the experimental design. A wild type adult ICR (CD1) mouse heart typically yields 500,000 to 1 million cardiomyocytes from a successful isolation. Immediately after isolation, the cells maintain a mostly rod-shaped appearance (Figure 3A) with intact sarcomeres and can be used for functional studies involving cardiomyocyte contractility. A high percentage of rod-shaped cardiomyocytes (above 90%) is an indication of effective perfusion and digestion. Viable cardiomyocytes will be large (~ 100 - 200 μm in length) and appear to have a sharp outer membrane under brightfield illumination (Figure 3A). Immunostaining for cardiomyocyte-specific sarcomeric markers, such as alpha-actinin, will result in a distinct sarcomeric banding pattern (Figure 3C). In conjunction with morphological analysis and nuclear staining with DAPI, immunostaining can be used to assess the purity of the isolated cardiomyocytes. Fibroblasts will be small and round just after isolation, but will quickly attach and spread thin on cell culture plastic, thus enabling facile distinction from cardiomyocytes. A low percentage of rod-shaped cardiomyocytes is an indication of an unsuccessful isolation. This can result from a failure to quickly cannulate the aorta after the heart is extracted from the animal. Inefficient perfusion, due to air embolism or incorrect cannulation for example, can also impact the morphology and viability of the cardiomyocytes. Figure 1. 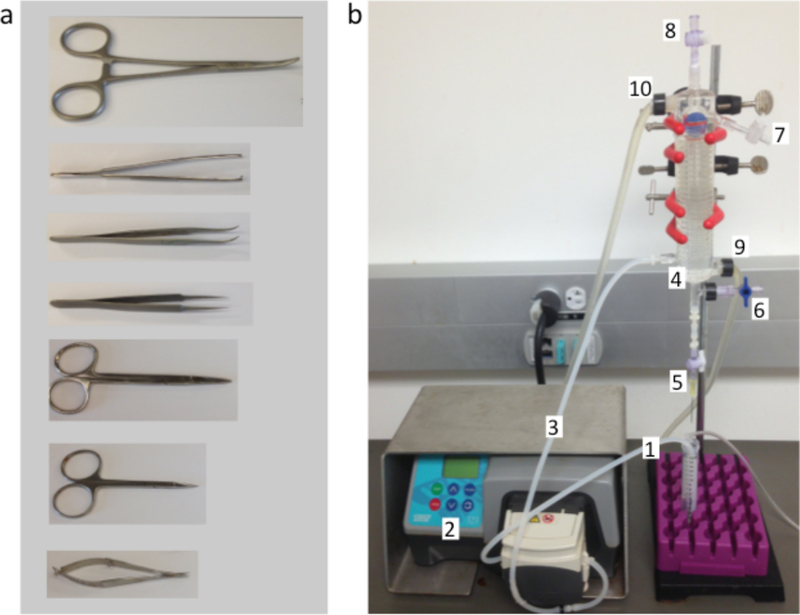 Cardiomyocyte Isolation Equipment and Instrumentation. (A) Surgical instruments used to extract the mouse heart and cannulate the aorta, from top to bottom: hemostats, tissue forceps, curved forceps, Dumont #5 fine forceps, small dissecting scissors, fine iris scissors, fine squeeze scissors. (B) The Langendorff perfusion system used to digest the mouse heart. Perfusion buffers are aspirated through the inlet tube (1) by the perfusion pump (2) and through the pump outlet tube (3) into the inlet port on the heated water jacket (4). 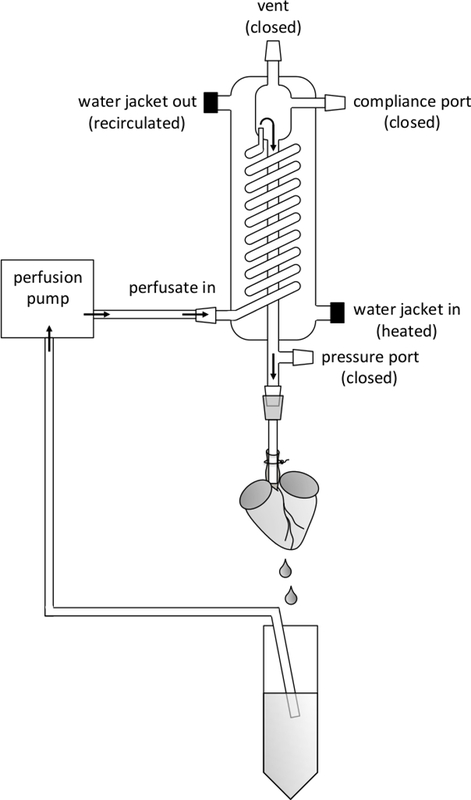 The perfusion buffers are warmed by the heated water jacket as they travel through the spiral glass tube, the debubbling chamber, and then out of the cannulation needle attached to the perfusion outlet port (5), which is connected by a stopcock. The conical tube below catches the perfusion buffers, which are re-circulated through the inlet tube. The pressure port (6), compliance port (7) and vent (8) remain closed during perfusion in order to maintain a constant flow rate. The water jacket is heated by a circulating water bath entering through the jacket inlet (9) and outlet (10) ports. A ring stand is used to hold the heated water jacket in a vertical position (red clamps, black base below the purple conical tube rack). Please click here to view a larger version of this figure. Figure 2. Schematic Overview of Perfusion System. Important Parts of the Perfusion Apparatus are Labeled as Referred to in the Manuscript. The flow direction of perfusion buffer is indicated by arrows. Note the positioning of the aortic cannula, the tip of which should be visible through the translucent aorta, ensuring it is placed above the aortic valve. Please click here to view a larger version of this figure. Figure 3. Isolated Adult Mouse Cardiomyocytes. Cardiomyocytes Were Isolated and Seeded onto Laminin-Coated 96 well Plates as Described in the Protocol Herein. (A) Freshly isolated cardiomyocytes, seeded at approximately 8,000 cells/cm2. Note that freshly isolated, viable cardiomyocytes appear approximately rod shaped with sharp edges (white arrowhead). However, cardiomyocytes that appear to have a diffuse outer membrane under brightfield are dead. During the first several days of culture, the cardiomyocytes assume a rounded shape (B). (C) Immunostaining for alpha-actinin (green) reveals characteristic sarcomeric banding in a cardiomyocyte at d1 post-isolation. Nuclear stain (DAPI) shown in blue. Top shows zoomed image of outlined region in lower image. (D) Organized sarcomeres can also be seen after redifferentiation in well spread cardiomyocytes at d11 post-isolation. (E) Brightfield and epifluorescent images show cardiomyocytes at day 11 post-isolation transduced with adenovirus carrying a GFP reporter under the control of a CMV promoter (a gift from Robert Gerard at UT Southwestern). Cells were seeded at approximately 18,000 cells/cm2 and were transduced on day 0 using a multiplicity of infection of approximately 800 plaque-forming units (PFU) per cell. Scale bars: 50 μm. Please click here to view a larger version of this figure. Add 900 ml of ultrapure water to a clean beaker under magnetic stirring. Add the buffer components in the table as indicated. Adjust the pH with 5 M NaOH. Adjust the volume to 1 L with ultrapure water. Sterile filter w/ 0.22 μM vacuum filter. Add 0.5 μl of 0.1 U/ml insulin per liter of cardiomyocyte isolation buffer. Allow culture media to equilibrate at 37 °C, 5% carbon dioxide. Table 1: Solutions and Buffers. The overall health of the isolated cardiomyocytes depends on several important aspects of this protocol. First, the time from heart extraction to perfusion is critical and should be performed in 5 min or less. Removal of calcium helps to dissociate cell-cell interactions, but can negatively impact cell health long-term.29-32 Thus, we find it sufficient to remove calcium during the initial few minutes of perfusion by EGTA (ethylene glycol tetraacetic acid) chelation,22 but quickly restore calcium during digestion and subsequent steps. The use of protease XIV greatly improves digestion efficiency compared to collagenase alone. This reduces inconsistency due to collagenase batch variability,18,24 and increases the purity of cardiomyocytes by facilitating separation during gravity sedimentation. Nonetheless, over-digestion will prevent efficient attachment to the culture substrate, so a fine balance is required to optimize cell yield and purity while maintaining cell attachment and viability. Thus, the concentration of proteases and length of digestion can be modified to suit the experimental goals. In general, a lesser degree of digestion will enhance the attachment and survival of the cardiomyocytes. Use of trypsin has been reported in some cardiomyocyte isolation protocols.18 However, addition of trypsin to the protease cocktail used here (collagenase and protease XIV) reduces the long-term viability of the cardiomyocytes in culture, perhaps due to over-digestion or cleavage of essential surface and/or extracellular matrix proteins. The inclusion of butanedione monoxime (BDM) during isolation inhibits cardiac muscle contraction, and thus reduces negative consequences due to terminal contracture, energy expenditure, and the calcium paradox.29,33 However, in our experience, removal of BDM prior to culture expedites dedifferentiation and allows the cells to adapt to culture in two dimensions. It is important to note that long-term adaptations to 2-D culture may affect functional aspects of the cardiomyocytes, such as contractility. Thus, contractility and electrophysiology experiments should be performed soon after isolation, when native sarcomeric organization is still intact. Furthermore, as with any in vitro experiment, the cells in culture are devoid of certain extrinsic influences present in vivo, such as humoral or immune signaling. On the other hand, defined co-cultures can be implemented to study the interactions between cardiomyocytes and other cell types.5,34 Additionally, in vitro culture can be used to study cardiomyocyte behavior with defined molecular signals in the culture media. Thus, the overall goals of the experiment should be carefully considered and weighed against the limitations and advantages of this culture system. The protocol described here uses 10% fetal bovine serum (FBS) to improve the viability of primary cardiomyocytes in culture.35 It should be noted that FBS and other animal-derived sera contain unknown components that can affect cellular physiology.36,37 Despite the well-appreciated presence of growth factors in FBS,38 the cardiomyocyte cultures presented here do not proliferate. Rather, the cell cycle block seems to be a persistent property of adult mouse cardiomyocytes ex vivo, maintained from their cell cycle exit during the perinatal period of development.12,39 This property is of major interest to the field of cardiac regenerative medicine, where reversion of adult mammalian cardiomyocytes to a proliferative phenotype has been a heavily pursued goal.3,26,40-42 Notably, it is currently unclear what degree dedifferentiation is required for cardiomyocytes to re-enter the cell cycle, but the contribution of dedifferentiation to regeneration in lower vertebrates is well supported43,44,10,11 Furthermore, dedifferentiation is increasingly being observed in cardiomyocyte proliferation and heart regeneration in mammalian systems, at least at the functional level, including myofibrillar disassembly6,12,9 Thus, the state of differentiation of cardiomyocytes in culture should be carefully considered and modulated according to the needs of the research goals. As such, the culture conditions can potentially be further modified to reduce serum concentration, use defined serum substitutes or serum-free media. For example, adult rat cardiomyocytes exhibiting organized sarcomeres were cultured long-term without serum, but growth factors such as fibroblast growth factor, epidermal growth factor, and triiodothyronine were used in defined media.45 It is conceivable that similar media formulations, or potentially other formulations such as those adapted from differentiation protocols,46 may be used to maintain well differentiated adult mouse cardiomyocytes in culture that display highly-organized sarcomeric structures. Alternative formulations may also be developed to achieve other phenotypes (such as highly de-differentiated cardiomyocytes)6 depending on the needs of the experiment, but further work will be required. The role of fibroblasts has been implicated in the control of neonatal mouse cardiomyocyte cell cycle5 and adult mouse cardiomyocyte differentiation (through hypertrophic IL6 signaling) in long-term culture.19 Hence, the growth of fibroblasts in culture should be accounted for in experimental interpretations. The growth of fibroblasts in culture can be controlled by addition of growth restricting compounds like cytosine arabinoside19 (AraC) or through pre-plating steps.28 However, AraC will also inhibit growth of cardiomyocytes, so alternative methods should be used to control the growth of fibroblasts in studies concerning the cardiomyocyte cell cycle. In the protocol described here, initial cardiomyocyte purity can be enhanced by repeating the gravity sedimentation step (see 1.4.8). The methods herein provide an in vitro system that can be used to study the nature of adult mammalian cardiomyocyte cell cycle blockade. In contrast to primary cells from other organisms, such as rat or guinea pig, primary mouse cardiomyocytes offer a wealth of powerful and well-characterized genetic tools, such as Cre-based lineage tracing knock-in models,47 which can be used to easily identify cells derived from pre-existing cardiomyocytes.12,48 Additionally, primary adult murine cardiomyocytes have been subjected to the native developmental conditions that result in cell cycle blockade, unlike cell lines and differentiated ES or iPSC cells46 which, despite their convenience and adaptability to large drug screens,2 may have limited utility in experiments probing the nature of adult cardiomyocyte cell cycle exit. This protocol outlines a reliable method to isolate and culture adult mouse cardiomyocytes. Several methods have previously demonstrated the isolation of adult mouse cardiomyocytes for short-term study, but to date, few reports exist of the long-term culture of adult-mouse cardiomyocytes.18,19 The ability to maintain adult mouse cardiomyocytes in culture should enable the in vitro study of cardiomyocyte biology under experimental conditions requiring long-term examination. For example, gene expression can be manipulated using adenovirus vectors, which typically require a few days to achieve full expression. Subsequent phenotypic changes and analysis may require even longer periods of time depending on experimental goals. The methods presented here allow the culture of adult mouse cardiomyocytes for several weeks. This should provide a powerful system for the investigation of prudent questions in cardiomyocyte biology, such as those pertaining to cell cycle regulation. This project was funded by the UCSF Program for Breakthrough Biomedical Research (funded in part by the Sandler Foundation), the NIH Pathway to Independence Award (R00HL114738), and the Edward Mallinckrodt Jr. Foundation. JJ was supported by a postdoctoral fellowship from the NIH (T32HL007731). The authors are solely responsible for the contents of this work, which does not necessarily represent the official views of the NIH. Patel, A. K., Celiz, A. D., et al. A defined synthetic substrate for serum free culture of human stem cell derived cardiomyocytes with improved functional maturity identified using combinatorial materials microarrays. Biomaterials. 61, 257-265 (2015). Mathur, A., Loskill, P., et al. Human iPSC-based Cardiac Microphysiological System For Drug Screening Applications. Sci Rep. 5, 8883 (2015). Mahmoud, A. I., Kocabas, F., et al. Meis1 regulates postnatal cardiomyocyte cell cycle arrest. Nature. 497, (7448), 249-253 (2013). Baumgartner, S., Halbach, M., et al. Electrophysiological and morphological maturation of murine fetal cardiomyocytes during electrical stimulation in vitro. J Cardiovasc Pharmacol Ther. 20, (1), 104-112 (2015). Ieda, M., Tsuchihashi, T., et al. Cardiac fibroblasts regulate myocardial proliferation through beta1 integrin signaling. Dev Cell. 16, (2), 233-244 (2009). Zhang, Y., Li, T. S., et al. Dedifferentiation and proliferation of mammalian cardiomyocytes. PLoS One. 5, (9), e12559 (2010). Engel, F. B., Schebesta, M., et al. p38 MAP kinase inhibition enables proliferation of adult mammalian cardiomyocytes. Gene Dev. 19, (10), 1175-1187 (2005). Sakurai, T., Lanahan, A., Woolls, M. J., Li, N., Tirziu, D., Murakami, M. Live cell imaging of primary rat neonatal cardiomyocytes following adenoviral and lentiviral transduction using confocal spinning disk microscopy. J Vis Exp. (88), e51666 (2014). Ahuja, P., Perriard, E., Perriard, J. C., Ehler, E. Sequential myofibrillar breakdown accompanies mitotic division of mammalian cardiomyocytes. J Cell Sci. 117, (Pt 15), 3295-3306 (2004). Kikuchi, K., Holdway, J. E., et al. Primary contribution to zebrafish heart regeneration by gata4(+) cardiomyocytes. Nature. 464, (7288), 601-605 (2010). Jopling, C., Sleep, E., Raya, M., Martì, M., Raya, A., Izpisúa Belmonte, J. C. Zebrafish heart regeneration occurs by cardiomyocyte dedifferentiation and proliferation. Nature. 464, (7288), 606-609 (2010). Porrello, E. R., Mahmoud, A. I., et al. Transient Regenerative Potential of the Neonatal Mouse Heart. Science. 331, (6020), 1078-1080 (2011). Heallen, T., Morikawa, Y., et al. Hippo signaling impedes adult heart regeneration. Development. 140, (23), 4683-4690 (2013). Lin, Z., Zhou, P., et al. Pi3kcb links Hippo-YAP and PI3K-AKT signaling pathways to promote cardiomyocyte proliferation and survival. Circ Res. 116, (1), 35-45 (2015). Zebrowski, D. C., Vergarajauregui, S., et al. Developmental alterations in centrosome integrity contribute to the post-mitotic state of mammalian cardiomyocytes. eLife. 4, e05563 (2015). Schluter, K. D., Piper, H. M. Practical Methods in Cardiovascular Research. Springer. Berlin Heidelberg: Berlin, Heidelberg. (2005). Zhou, Y. Y., Wang, S. Q., et al. Culture and adenoviral infection of adult mouse cardiac myocytes: methods for cellular genetic physiology. Am J Physiol Heart Circ Phys. 279, (1), H429-H436 (2000). Kruppenbacher, J. P., May, T., Eggers, H. J., Piper, H. M. Cardiomyocytes of adult mice in long-term culture. Naturwissenschaften. 80, (3), 132-134 (1993). Fredj, S., Bescond, J., Louault, C., Potreau, D. Interactions between cardiac cells enhance cardiomyocyte hypertrophy and increase fibroblast proliferation. Journal of Cellular Physiology. 202, (3), 891-899 (2005). Li, Z., Sharma, R. V., Duan, D., Davisson, R. L. Adenovirus-mediated gene transfer to adult mouse cardiomyocytes is selectively influenced by culture medium. J Gene Med. 5, (9), 765-772 (2003). Luo, J., Deng, Z. L., et al. A protocol for rapid generation of recombinant adenoviruses using the AdEasy system. Nat Protoc. 2, (5), 1236-1247 (2007). Shioya, T. A simple technique for isolating healthy heart cells from mouse models. J Physiol Sci. 57, (6), 327-335 (2007). Li, D., Wu, J., Bai, Y., Zhao, X., Liu, L. Isolation and culture of adult mouse cardiomyocytes for cell signaling and in vitro cardiac hypertrophy. J Vis Exp. (87), e51357 (2014). Wolska, B. M., Solaro, R. J. Method for isolation of adult mouse cardiac myocytes for studies of contraction and microfluorimetry. Am J Physiol Heart Circ Phys. 271, (3), H1250-H1255 (1996). Pinz, I., Zhu, M., Mende, U., Ingwall, J. S. An improved isolation procedure for adult mouse cardiomyocytes. Cell Biochem Biophys. 61, (1), 93-101 (2011). Di Stefano, V., Giacca, M., Capogrossi, M. C., Crescenzi, M., Martelli, F. Knockdown of cyclin-dependent kinase inhibitors induces cardiomyocyte re-entry in the cell cycle. J Biol Chem. 286, (10), 8644-8654 (2011). Malouf, N. N., McMahon, D., Oakeley, A. E., Anderson, P. A. A cardiac troponin T epitope conserved across phyla. J Biol Chem. 267, (13), 9269-9274 (1992). Ehler, E., Moore-Morris, T., Lange, S. Isolation and culture of neonatal mouse cardiomyocytes. J Vis Exp. (79), e50154 (2013). Daly, M. J., Elz, J. S., Nayler, W. G. Contracture and the calcium paradox in the rat heart. Circ Res. 61, (4), 560-569 (1987). Piper, H. Culturing of calcium stable adult cardiac myocytes. J Mol Cell Cardiol. 14, (7), 397-412 (1982). Ashraf, M. Correlative studies on sarcolemmal ultrastructure, permeability, and loss of intracellular enzymes in the isolated heart perfused with calcium-free medium. Am J Pathol. 97, (2), 411-432 (1979). Piper, H. The calcium paradox revisited An artefact of great heuristic value. Cardiovasc Res. 45, (1), 123-127 (2000). Higuchi, H., Takemori, S. Butanedione monoxime suppresses contraction and ATPase activity of rabbit skeletal muscle. J Biochem. 105, (4), 638-643 (1989). Rother, J., Richter, C., et al. Crosstalk of cardiomyocytes and fibroblasts in co-cultures. Open biology. 5, (6), 150038 (2015). Fujio, Y., Nguyen, T., Wencker, D., Kitsis, R. N., Walsh, K. Akt Promotes Survival of Cardiomyocytes In Vitro and Protects Against Ischemia-Reperfusion Injury in Mouse Heart. Circulation. 101, (6), 660-667 (2000). Dambrot, C., Braam, S. R., Tertoolen, L. G. J., Birket, M., Atsma, D. E., Mummery, C. L. Serum supplemented culture medium masks hypertrophic phenotypes in human pluripotent stem cell derived cardiomyocytes. Journal of cellular and molecular medicine. 18, (8), 1509-1518 (2014). Karliner, J. S., Simpson, P. C., Taylor, J. E., Honbo, N., Woloszyn, W. Adrenergic receptor characteristics of cardiac myocytes cultured in serum-free medium: Comparison with serum-supplemented medium. Biochemical and Biophysical Research Communications. 128, (1), 376-382 (1985). Zheng, X., Baker, H., Hancock, W. S., Fawaz, F., McCaman, M., Pungor, E. Proteomic analysis for the assessment of different lots of fetal bovine serum as a raw material for cell culture. Part IV. Application of proteomics to the manufacture of biological drugs. Biotechnology progress. 22, (5), 1294-1300 (2006). Soonpaa, M. H., Kim, K. K., Pajak, L., Franklin, M., Field, L. J. Cardiomyocyte DNA synthesis and binucleation during murine development. Am J Physiol. 271, (5 Pt 2), H2183-H2189 (1996). Engel, F. B., Hsieh, P. C. H., Lee, R. T., Keating, M. T. FGF1/p38 MAP kinase inhibitor therapy induces cardiomyocyte mitosis, reduces scarring, and rescues function after myocardial infarction. P Natl Acad Sci USA. 103, (42), 15546-15551 (2006). Tian, Y., Liu, Y., et al. A microRNA-Hippo pathway that promotes cardiomyocyte proliferation and cardiac regeneration in mice. Sci Transl Med. 7, (279), 279ra38 (2015). Soonpaa, M. H., Koh, G. Y., et al. Cyclin D1 overexpression promotes cardiomyocyte DNA synthesis and multinucleation in transgenic mice. J Clin Invest. 99, (11), 2644-2654 (1997). Stewart, S., Stankunas, K. Limited dedifferentiation provides replacement tissue during zebrafish fin regeneration. Dev Biol. 365, (2), 339-349 (2012). Wu, C. H., Huang, T. Y., Chen, B. S., Chiou, L. L., Lee, H. S. Long-Duration Muscle Dedifferentiation during Limb Regeneration in Axolotls. PLoS One. 10, (2), e0116068 (2015). Nag, A. C., Lee, M. L., Kosiur, J. R. Adult cardiac muscle cells in long-term serum-free culture: myofibrillar organization and expression of myosin heavy chain isoforms. In vitro cellular & developmental biology journal of the Tissue Culture Association. 26, (5), 464-470 (1990). Lian, X., Hsiao, C., et al. Robust cardiomyocyte differentiation from human pluripotent stem cells via temporal modulation of canonical Wnt signaling. P Natl Acad Sci USA. 109, (27), E1848-E1857 (2012). Sohal, D. S., Nghiem, M., et al. Temporally Regulated and Tissue-Specific Gene Manipulations in the Adult and Embryonic Heart Using a Tamoxifen-Inducible Cre Protein. Circ Res. 89, (1), 20-25 (2001). Hsieh, P. C. H., Segers, V. F. M., et al. Evidence from a genetic fate-mapping study that stem cells refresh adult mammalian cardiomyocytes after injury. Nat Med. 13, (8), 970-974 (2007).